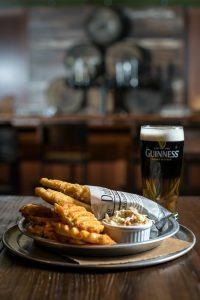 WILKES-BARRE, PA (February 13, 2019) – It’s St. Patrick’s Day at Mohegan Sun Pocono and Molly O’Sheas is the home base for all things green and gold. The Irish Pub & Eatery is offering specials and live entertainment from Friday, March 15th to Sunday, March 17th. Molly O’Sheas is also welcoming the return of the Reuben Challenge. Order a 4lb Reuben (valued at $29.99) and if it’s eaten in 60 minutes or less, the Reuben is free. Those who complete the challenge also receive a free t-shirt. Molly O’Sheas’ regular drink specials are another way to enjoy St. Patrick’s Day weekend. On Friday, guests can enjoy happy hour with 1/2 off draft beer from 5:00pm – 7:00pm. From 7:00pm – Midnight, Guinness drafts are only $3.00. Saturday from Noon – 7:00pm, bottles of Coors Light are $2.50 and happy hour starts at 7:00pm with 1/2 off all drinks. All day Sunday, celebrate with $8.00 Miller Lite Pitchers. It wouldn’t be a celebration at Molly O’Sheas without live entertainment! Mama’s Black Sheep kick off the holiday weekend with a performance from 9:00pm – Midnight. On Saturday, Chasing Ashlee Duo performs from 9:00pm – Midnight. Sunday’s celebration wraps up with a live DJ and karaoke from 8:00pm – 11:00pm.